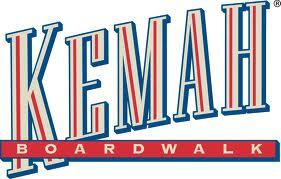 Welcome to the Kemah Boardwalk. Aviator (foreground) and Drop Zone (background). Aviator has an awesome lighting package. All right, let's get to why I am even here. This huge pile of lumber is a great ride. IF you ride in the front. It's really hard to figure out the layout off the ride. Again, ride in the front and you'll have a good time. That was a fun stop.